September in the Pacific Northwest. The glassy surface of Seattle’s Duwamish River is being shattered by salmon doing their best to evade a small, but voracious herd of marauding sea lions. 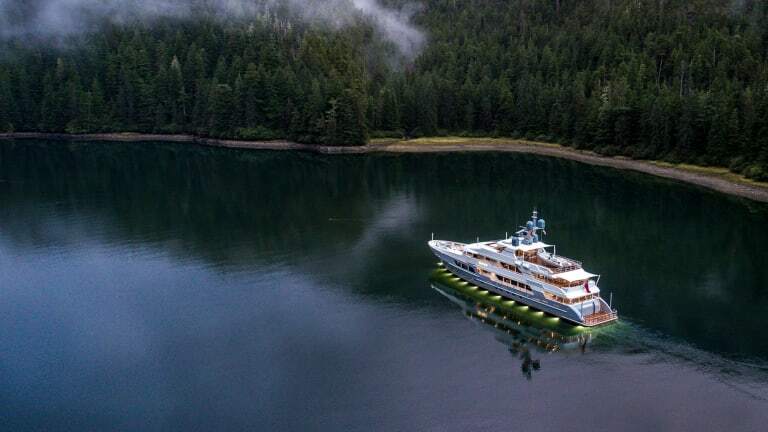 Moored peacefully alongside the dock at Delta Marine Industries, the recently launched 164-foot (50-meter) motoryacht Endless Summer is in the final days of preparation to depart for the South Pacific, a voyage expected to continue until the middle of 2019. At the moment, however, obstructed by tribal gillnets, the river is closed to vessel traffic, stranding Capt. Anthony Hodgson and his crew at the shipyard. 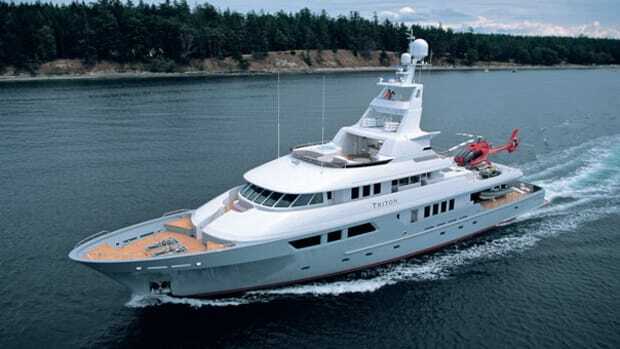 Designed for family use and occasional charter as part of the Y.CO fleet, Endless Summer began construction at Christensen Shipyards in Vancouver, Washington, and moved to Delta for completion. 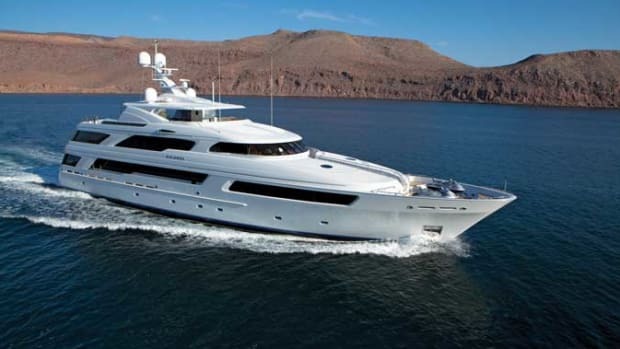 The two-year project resulted in a yacht capable of fulfilling the dual mission that the owner and his wife outlined. 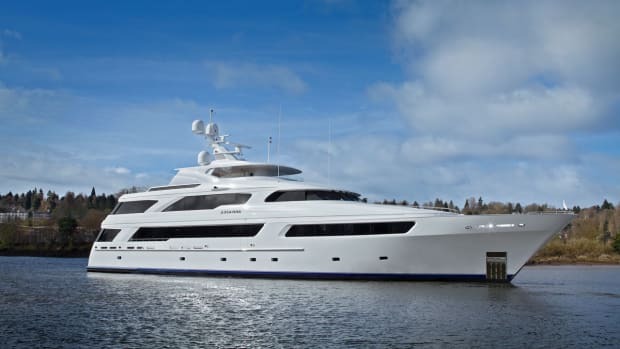 Before starting the project, the couple co-owned a 125-foot (38-meter) boat with another family for nearly a decade. 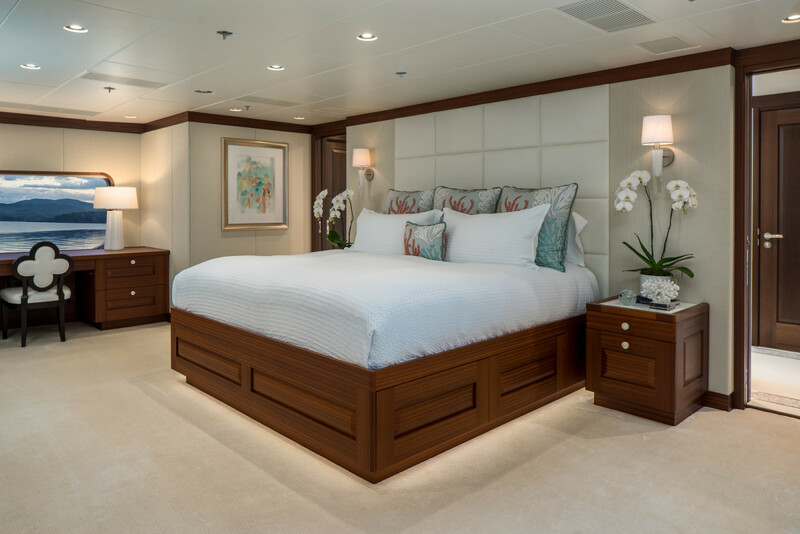 After that boat sold, he wanted a yacht that would provide his growing family with more space while broadening their cruising horizons. He and his wife commissioned Tonya Lance, the principal of Camas, Washington-based Varo Interior Design. Hodgson, who has worked for the family for 14 years, served as the owners’ representative. “[The clients] were both very consistent in their brief and definitely carried it out throughout the project,” Lance says. “They came in wanting a clean, modern, sophisticated design. They wanted it practical, because they were thinking about chartering and have adult children and a growing family. So, they wanted [the design] to make sense. Stowage built into the hardtop is not visible from the decks. 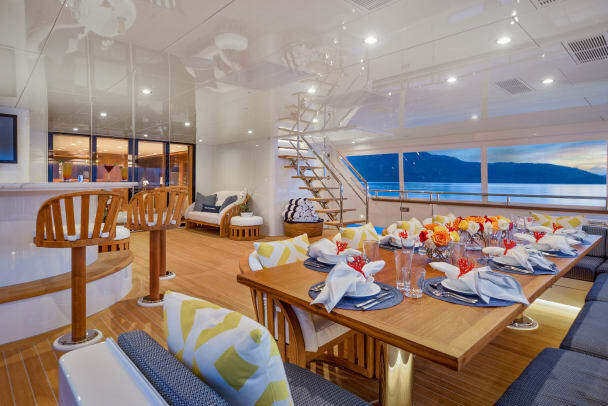 The owners’ love of the outdoors is also seen in the yacht’s layout. The arrangement on most Christensens of this size includes an entrance lobby in the after end of the main salon. 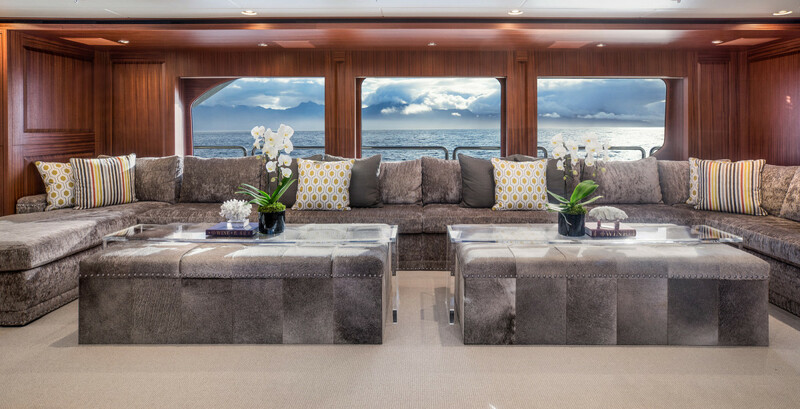 The owner’s wife requested that a bulkhead be moved forward, eliminating the lobby and creating additional exterior gathering space for a pair of facing sofas. 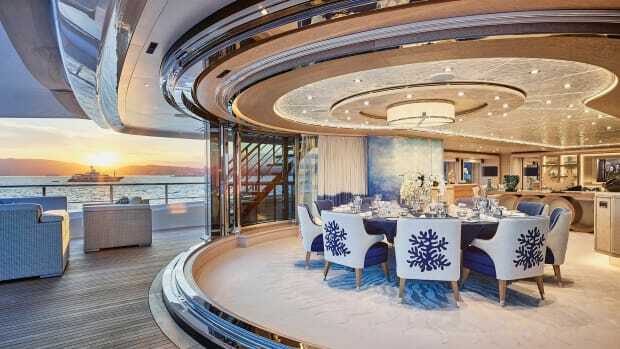 The space is expected to be helpful during shore excursions, as well. 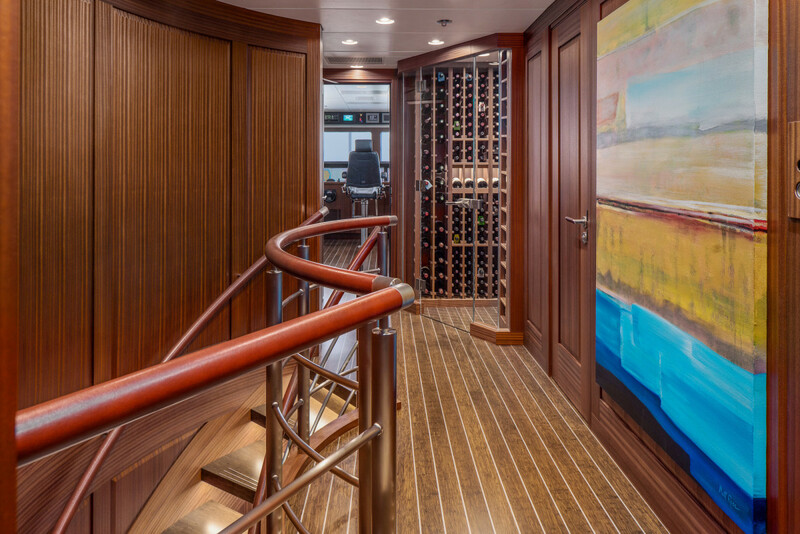 The owners also enjoy fine wines, so a glass-enclosed, walk-in wine cellar was added on the bridge deck. It can hold 60 magnums and 397 standard bottles. A commercial wine chiller in the pantry has space for another five dozen bottles, many of which will be selected to appeal to charter guests. The owner’s wife also worked with Lance to develop a dining table that converts from a single unit for 12 guests to a pair of square tables. Hodgson’s input resulted in several additional features, some that will be known only to crew: extra stowage throughout the yacht; repositioned stabilizer fins to reduce noise in the guest staterooms; stowage for extra dining chairs on a platform in the elevator shaft; and racks and lockers for water-sports equipment. Others features are even more clever—and visible. 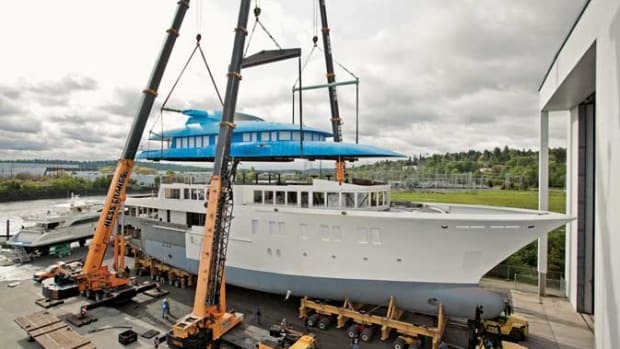 One, dubbed “The Transformer,” is an articulating platform that deploys from within the swim platform; another is a retractable balcony outside a sliding door from the bridge-deck lounge. Still another is an outdoor theater with a 16-by-13-foot screen on the after end of the sundeck with surround sound. 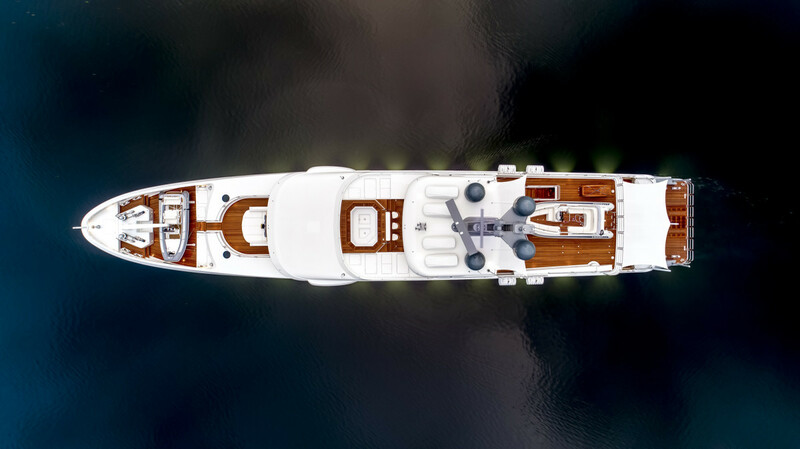 The high-definition projector is embedded unobtrusively on the after side of the mast. Endless Summer’s upcoming itinerary includes ports throughout the Pacific before a return to the U.S. West Coast and a cruise to Florida by way of the Panama Canal. 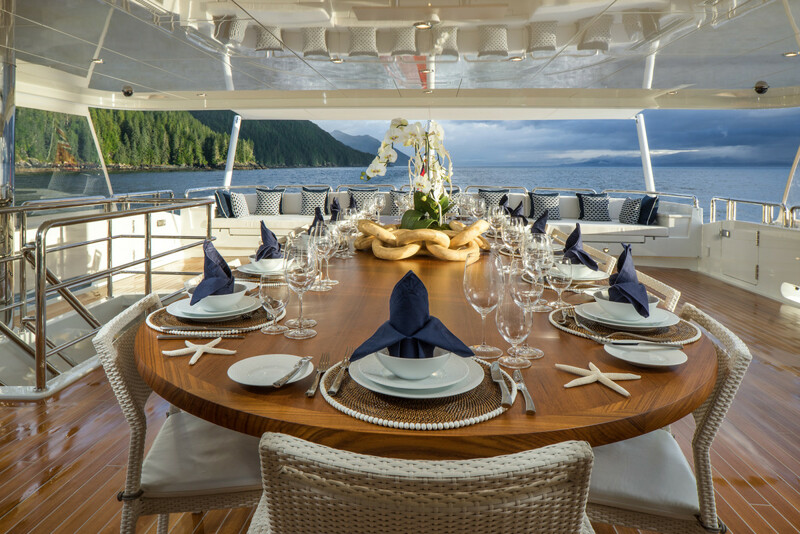 Y.CO is promoting charter itineraries in Fiji and New Zealand at a weekly base rate of $250,000 for 12 guests. 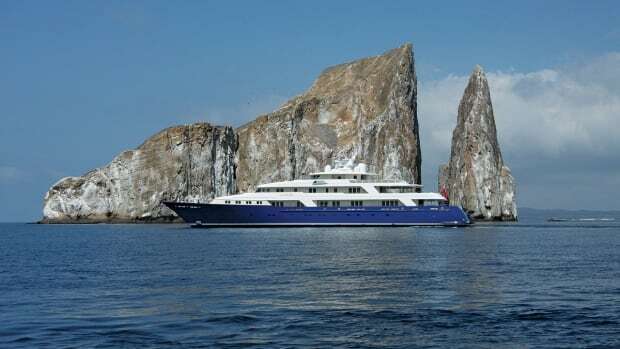 The destinations are unusual for a U.S.-built yacht, which may be exciting to American charter clients. 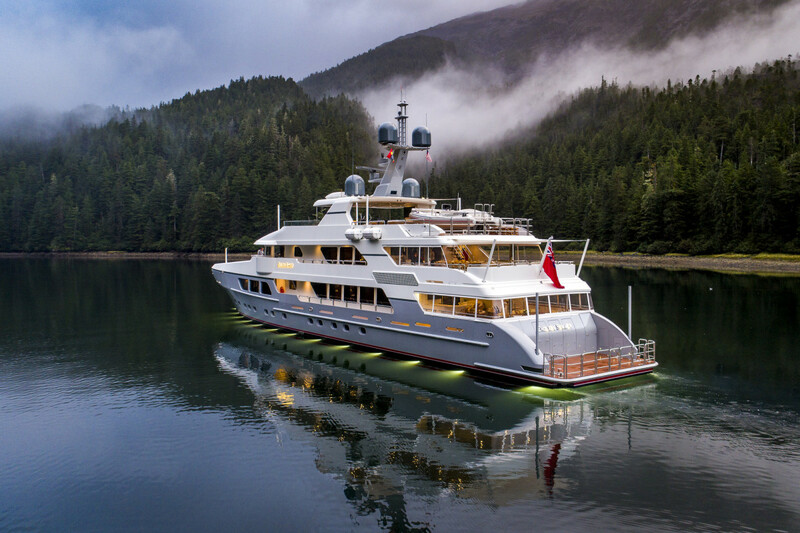 M/Y Endless Summer puts on a private light show during her shakedown cruise in the Pacific Northwest last summer. 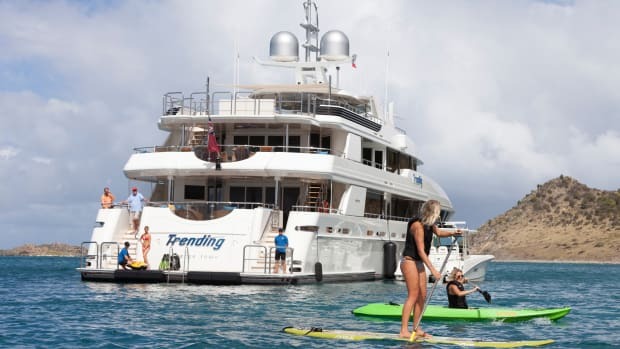 The owners of Endless Summer have a growing family that loves water sports. 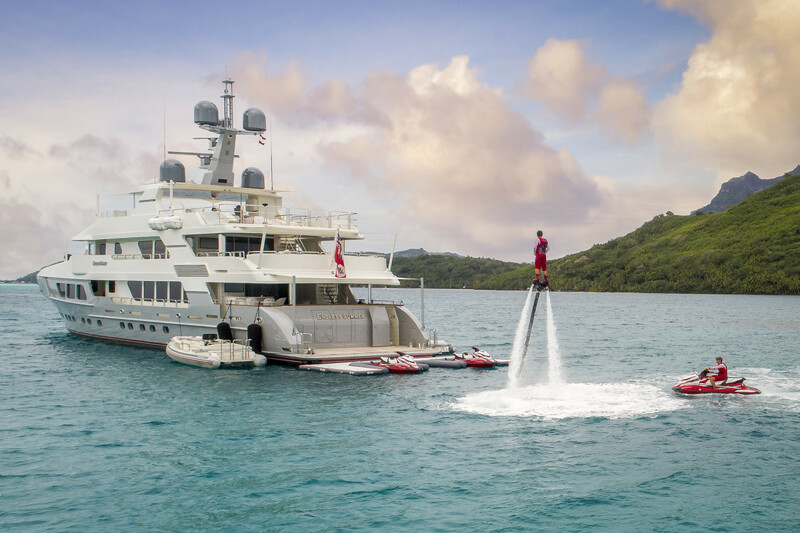 Charter clients will be able to take advantage of the yacht’s substantial toy chest, which includes Seabobs, a Flyboard, electric surfboards, Sea-Doos, a hydrofoil Air Chair, kayaks, standup paddleboards, fishing gear, water skis, kneeboards, scuba and snorkeling gear, an inflatable waterslide, various tow toys and floating furniture. 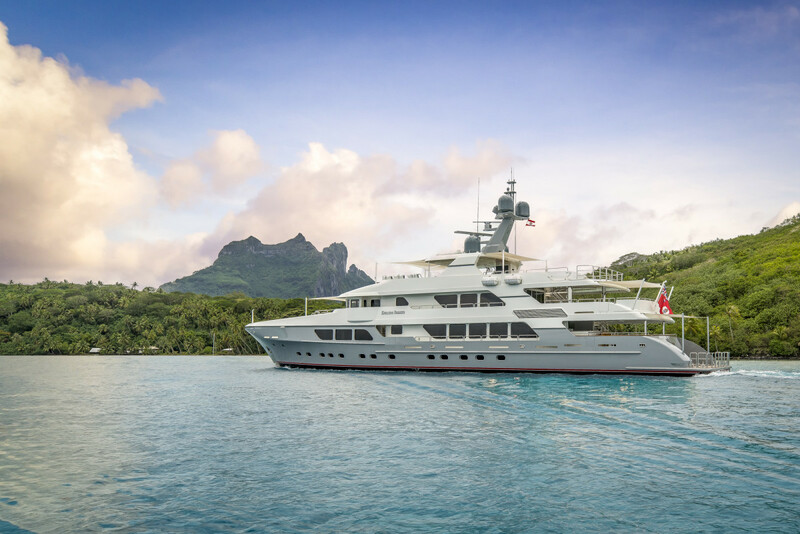 M/Y Endless Summer, with part of her tremendous arsenal of water toys, PWC and tenders on display.